With that, Bata went away to the Valley of the Cedars and Anubis God entered his house full of grief. He slew his wife and cast her to the dogs and mourned his brother. After a long journey, Bata found a tall cedar and placed his heart on top of its flower in the highest branches. He built a fine house for himself and he lived in contentment, except that he lacked a wife. One day he met with the Nine Gods (the Ennead) who told him that Anubis God now understood the truth and had slain his false wife. Ra-Herakhty asked Khnum to make a wife to keep Bata Company, and the god fashioned a woman on his potter’s wheel. She was the fairest woman in the land and had the essence of all the gods in her. But the Seven Hathors came like the fates and foretold that she would meet an unhappy end. Bata loved his wife and laid before her all the game he killed. He cautioned her not to leave the house: “Go you not out for fear the sea will carry you away. As I am no longer a complete man, I cannot protect you.” In addition, he told her about his heart in the top of the cedar. One day while he was hunting, his wife disobeyed orders and wandered out alone. When the sea saw and chased her, she ran toward the security of her home. The sea asked the cedar to catch her, but all the tree could do was snip a lock of her hair. Accepting the hair, the sea carried it on its waves to Egypt and deposited it on the shore where the women were washing the king’s clothes. The hair perfumed the wash and left a wonderfully sweet smell in the garments. The king consulted with his wisest advisors in order to discover the source of the perfume. One of their numbers told the king, “This lock of hair belongs to a daughter of Ra-Herakhty and she is made of the essence of all the gods.” The king then sent his men into all the lands searching for the woman, and not without difficulty they found her and brought her to him. He immediately fell in love with the beautiful woman, and she told him of her husband and his heart in the tree. The king gave orders, “Have the tree cut down and the flower destroyed.” And his men found the tree and cut off its flower, and in that instant Bata died. Shortly afterward, Anubis God sat down to a meal. When his beer was placed in front of him it had fermented and produced froth and he knew this omen was a message for him. At once he set on his journey to the Valley of the Cedars; there he found his brother’s body lying dead in his house and he went in search of the heart. For three years he sought it in vain and one day said to himself that this was his last night on the quest as he longed to return to Egypt. He spent the next day in search and at dusk gave up. He had found only a berry from the cedar and as a memento took it home. Unknown to him, this was the heart he had so long sought. At home he sat down and dropped the berry in a cup of cold water. Overnight the berry soaked up the water and began to thrive. Bata’s body, which had been brought along on the quest, began to shudder and he opened his eyes while the heart was still in the cup. Anubis God took the cup and gave it to his younger brother to drink. When he swallowed the liquid and its contents, the heart returned to its rightful place and Bata was well again. The brothers embraced and Bata knew Anubis’ devotion in search of his heart. At dawn Anubis God and Bata journeyed to the king. The entire land rejoiced at the sight of so marvelous an animal; they gave him his weight in gold and silver and he returned to his village to live. “I am Bata. You knew when you asked that the tree be cut down, I would die. But here I am. See, I am alive and am a bull." This did not please the woman, who went to the king and coquettishly begged for a favor using all her womanly charms. “Let me eat the liver of this bull for he is not worth anything.” The king regretted the death of so fine a bull, but he yielded in order to keep his new consort happy. A great festival was proclaimed and the bull was slaughtered as sacrifice. At the moment of death, the bull shook himself and caused two drops of blood to fall beside the door of the king’s palace. In an instant two great persea trees grew where the blood had landed, and all the land rejoiced at so marvelous a sight. When the king and his consort came to witness the trees, Bata, who was living in the heart of the tree, secretly told his wife, “See, I m still alive. I am Bata and you have tried to kill me twice.” Again the woman worked her way with the king: “Cut down the persea trees and have they made into fine furniture for your house.” The king could not resist so beautiful a woman and did as s e requested. The finest craftsman in the nation was sent for. As he felled the trees and began to mill them, a chip from the tree flew from his ax and entered the mouth of the king’s consort, who Carne pregnant. In due time she delivered a handsome boy who as said to be the son of the king. The entire land rejoiced and e king appointed the child viceroy of Kush and later crown prince of the whole country. The king ruled for many more years, but eventually he flew into heaven. His son, as new king, called his royal counsellors into session and told them that he and Bata were one and the same. He then accused his wife (and mother) and bore testimony of her wickedness. The counsellors agreed with Bata in his harsh sentence on the disgraced woman. The new king then summoned Anubis God to his side and appointed him crown prince. Bata ruled for thirty years and at his death his elder brother acceded to the throne. 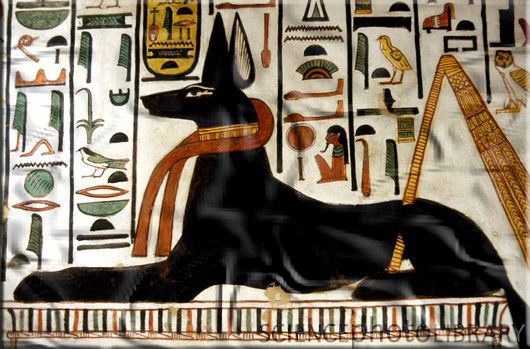 For the modern visitor to Egypt, Anubis God is one of the most visible of the gods. There are numerous drawings of him in various papyri, especially in the vignettes of the Book of the Dead, and on the walls of tombs and temples from Abydos to Aswan. Probably his most graceful representation is the statue of a reclining, but alert, black animal in the Tutankhamun collection in the Egyptian Museum.